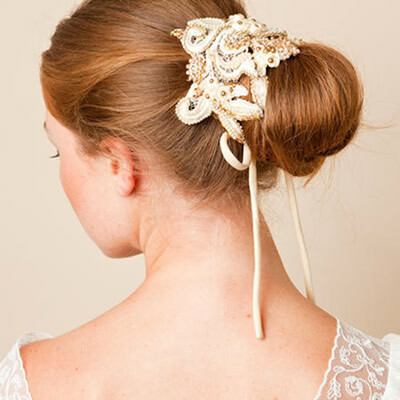 If, as a bride, you’re striving for an original look, there’s nothing quite like a beautiful handmade hair accessory. These accessories – which can be a birdcage veil or just a small detail – may compliment the entire look or simply be worn during the wedding reception, allowing the bride’s glow and originality to shine through. Created with handmade flowers, lace from the Edwardian era and covered with Preciosa stones, this hair accessory for brides is truly impressive. 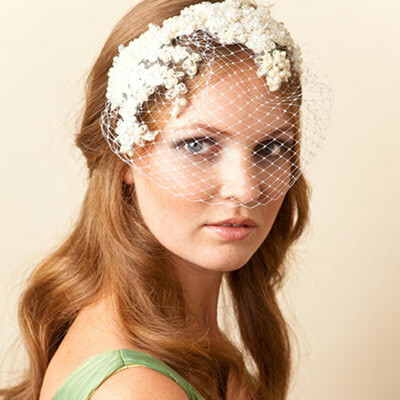 A romantic handmade halo with silk flowers and a mixture of Preciosa stones for a look that will definitely turn heads. A fantastic piece: a collection of chiffon flowers topped by Preciosa stones give way to a small and delicate veil, adorned with Preciosa crystals. Because every bride deserves to be a princess, this hair accessory is pure romance. Light and airy with delicate silk forming soft ruffles, it is adorned with French lace, Preciosa crystals and a mixture of pearls. The piece comes with a headband for easy wearing. For a beautiful bridal hairstyle, look no further than this piece made entirely of French lace and covered with Preciosa crystals and pearls. A lovely piece. This accessory for the bride’s hair is extremely romantic and comprised of silk flowers and Preciosa stones. For a more romantic wedding, a silk scarf covered with lace and pearls – an exceptional piece to change into after the ceremony and before the wedding reception. For a bride who truly wants to shine, this hair accessory is made of French lace, white ostrich feathers, vintage crystals and a mixture of Preciosa stones. For a boho style bride, this halo created with handmade velvet flowers and a mixture of Preciosa pearls is stunning. An adorable piece with flowering roses, this delicate veil is adorned with Preciosa crystals and pearls. Who can resist a hair piece from the 1930s? A French lace ribbon with Preciosa crystals and pearls makes this accessory simply unique, for an equally unique bride. A unique hair accessory that invokes old Hollywood glamour, it was created with delicate French lace, adorned with hand sewn pearls and three silk flowers decorated with Preciosa pearls. Inspired by old Hollywood glamour, this bridal hair accessory was created with fine French lace, chiffon pearl-covered flowers and incorporated into a delicate headband. A fairytale like birdcage veil made with French lace and bejeweled with a collection of dainty stones. Very chic, this stunning bridal hair accessory is comprised of light and delicate French lace with pearl-colored ostrich feathers. The small veil is shielded by a lace bow and Preciosa pearls. One simple accessory can make a very big difference. This hair adornment is composed of French lace and decorated with Preciosa crystals and pearls. Perfect for putting on after the ceremony, when the veil is removed for the wedding reception. All hair accessories are available online at Jannie Baltzer.